Tuesday, Nov. 3, 2009 at 9:05 p.m. Independent voters are said to be the lynchpin to electoral success in the Garden State. This is especially true for a Republican fighting a significant Democratic advantage in party registration, who needs a nearly 2 to 1 margin to overcome that partisan split. 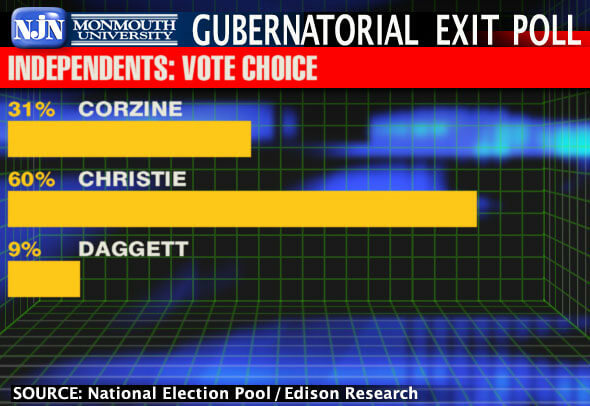 So, how well did Chris Christie do among independent voters in the race for New Jersey governor today? The GOP nominee claimed 60% of the independent vote, outpacing Democrat Jon Corzine at 30% and independent Chris Daggett at 9%. These vote shares were nearly identical for both women and men independents. The top issues for independent voters in their vote choice today were the economy and jobs (31%), property taxes (29%), corruption (27%), and health care (13%). “That fact that independent voters rated corruption as such an important issue in their vote today indicates that they are really upset with the current political system,” said Patrick Murray, director of the Monmouth University Polling Institute and exit polling analyst for NJN News and Gannett New Jersey.